Step It Up: Dignity, Rights, Development is the global campaign launched by the Migrant Forum in Asia network and affiliated civil society organizations, trade unions, the Committee on the Protection of the Rights of All Migrant Workers and Members of their Families, and the International Labour Organization, which highlights the significance of the International Convention on the Protection of the Rights of All Migrant Workers and Members of their Families (CMW / UN Migrant Workers Convention). 18 December 2015 marks the 25th anniversary of the adoption of the Convention that specifically guarantees the rights of all migrant workers and members of their families. The 25th anniversary of the UN Migrant Workers Convention is the perfect occasion for the migrants’ rights movement to magnify the unwavering advocacy for further ratification and implementation of this international human rights instrument, which looks after the human rights and labor rights of migrant workers and extends protection to members of their families. 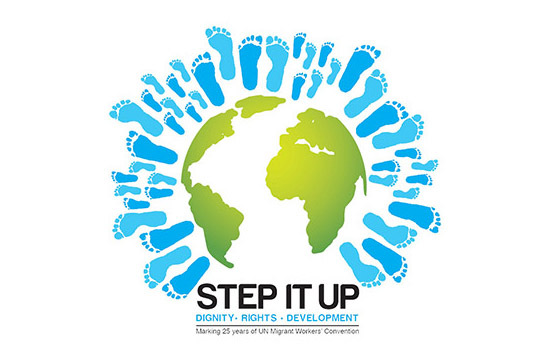 Launched on 18 December 2014, the Step It Up campaign encourages all stakeholders – States parties, trade unions, employers’ organizations, civil society organizations, migrant workers and members of their families to take part in this year long global initiative, beginning on 18 December 2014 to 18 December 2015. Activities relating to the promotion of the human rights of migrant workers and members of their families as well as engagements with States to ratify the CMW find space here, in the online platform of the Step It Up campaign. The online platform of the Step It Up campaign centers on the following themes: promotion of the ratification of the UN Migrant Workers Convention, children of migrant workers, particularly ending immigration detention of children, migrant domestic workers, contributions of migrant workers in the countries of origin and destination, and situations of forced labor, human tracking and slavery-like practices that migrant workers experience. The campaign also links up with other ratification efforts, including the ILO Convention on Domestic Work No. 189 (C189), ILO Convention No. 97 (Migration for Employment Convention), ILO Convention No. 143 (Migrant Workers Convention) and the ILO Forced Labour Protocol. These themes and the ratification of international human rights and labor rights treaties directly impact the lives and the realization of the rights of all migrant workers and members of their families. The Step It Up campaign through the online platform strives to weave together these interrelated issues and underscores that migration is not an isolated matter but is tied to various dimensions of peoples’ struggles for equality, dignity, decent work and human rights. 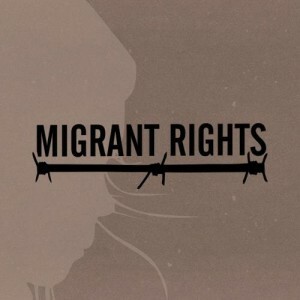 The posts you see on this online platform place migrant workers and members of their families at the heart of the discussions on migration and illustrate how the UN Migrant Workers Convention can positively affect their dignity, rights, and development. Support among States for the ratification of the UN Migrant Workers Convention is faltering. It received 20 ratifications necessary for its entry in to force in 2003, 13 years after its adoption. To date, there are 48 ratifications, mostly by sending States, while receiving States are notably underrepresented. More information about the UN Migrant Workers Convention, including its complete provisions, can be found here.